The Trek Sport 75 has a 500 pound capacity and fits in standard pickup boxes for easy transport. Its robust built is designed to be pulled by a motorized vehicle and can haul everything you want for your outdoor expeditions in the wilderness. 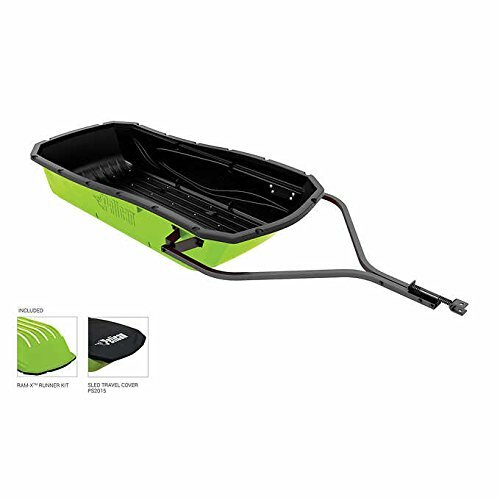 The Trek Sport 75 features RAM-XTM runners and is designed to accommodate homemade dividers to stabilize your cargo (template is included with the sled). It is available in a combo package including a shock adsorbing and reinforced metal tow hitch, and an adjustable travel cover. Features: Excellent for carrying various equipment RAM-XTM runners Metal tow hitch Adjustable travel cover Dimensions: 74" L x 30.5" W x 16.5" H Weight: 55 lbs. If you have any questions about this product by PelicanSled, contact us by completing and submitting the form below. If you are looking for a specif part number, please include it with your message. Paricon 648 Winter Lightning Flex Flyer Sled, 48"